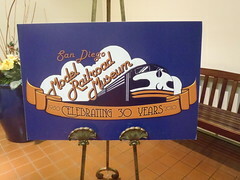 After visiting the San Diego Automotive Museum, we walked over to the San Diego Model Railroad Museum, which is also in Balboa Park. 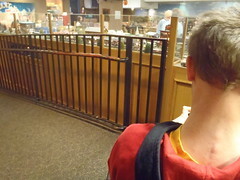 It was kind of cool to see the model trains, but Mik did not like it at all. 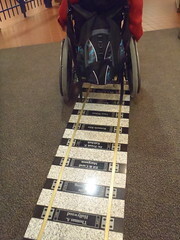 He had several complaints related to the accessibility. For one, he did not like that they have railroad tie looking plaques in the middle of the walkway through the museum. It made it bumpy to roll on it and since it was narrow one wheel would be on it and the other not, yet there was not enough room to either side to totally avoid it in most parts. That was a minor complaint, though, as it still a cool feature. 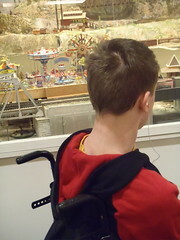 The more major issue is that most of the exhibits were too high to be seen from his wheelchair. I get they cannot be too low for the people building them to work on them, but one of them were so high that even Dad could not really see it without going up the step areas (I think it was the Tehachapi Pass one). At least the Toy Train Gallery is in a separate room that the ramp goes down into, so you started at a high enough point to view everything. However, when we went all the way down into the room it got kind of hard for Mik to see much. 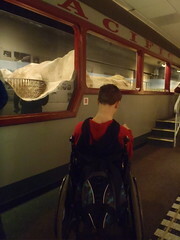 This room, though, also had windows overlooking it from the main pathway, so it could be enjoyed from a wheelchair pretty well. He also did not like that we started with the path to the left of the entrance and as we followed it up we ended up at a dead end of stairs. There is another exhibit continuing on from there, but it is not open yet. Basically, you have to backtrack through that path to then go do the other area. Of course, this is the path that leads to the separate room that was the only worthwhile part of the museum to Mik. The main area to the right of entrance/bottom of stairs from top path has a few different train models. They were not as high as the main one on the first path we went on. One of them (Pacific Desert Line?) was actually low enough he could see most of it, but by the time we got there he was frustrated (and ready for lunch! ), so he did not really care.